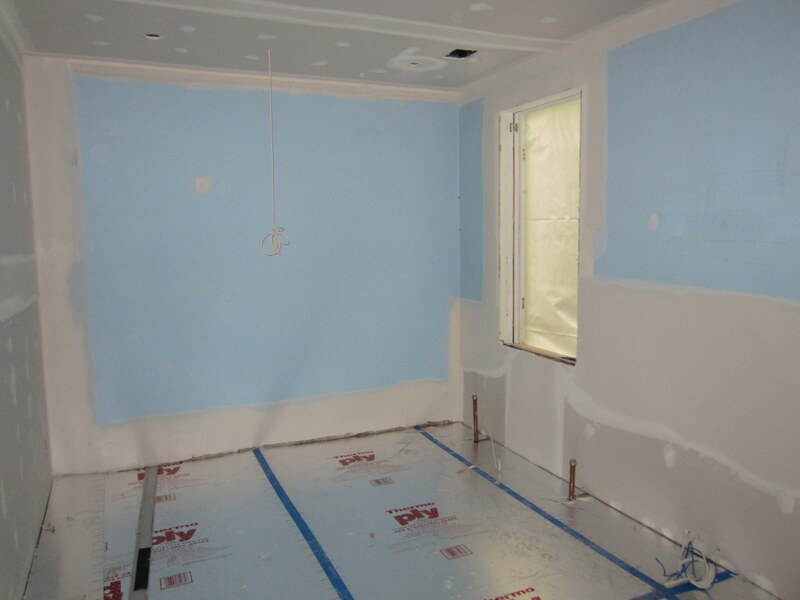 After the last of the insulation was installed, a horde of drywallers descended upon the house and worked non-stop for 5 days, completely transforming the feel of the house. 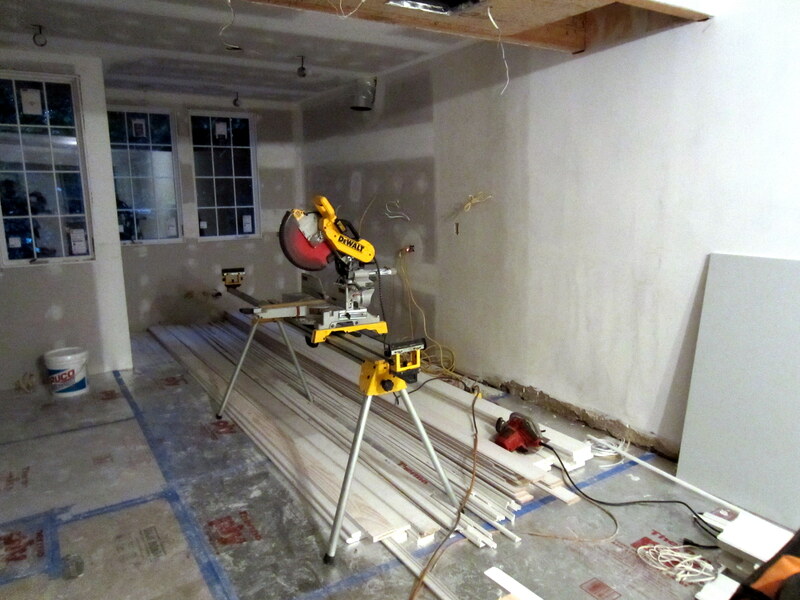 We’ve been used to seeing the house in the context of exposed framing for a few months, so this step in the renovation had a dramatic impact. 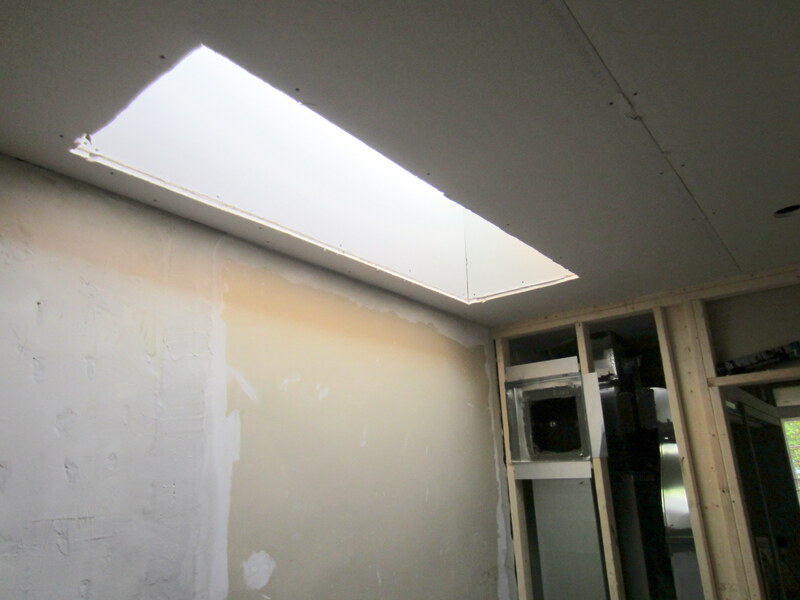 The skylights, ceilings, and framed walls in the bathrooms get the treatment . . . In the guest room, old drywall on the top portion on north side still remains, but the bottom portion needed to be replaced, since the drywall behind the old radiator was never actually installed years ago – the homeowner simply stuck a piece behind it. 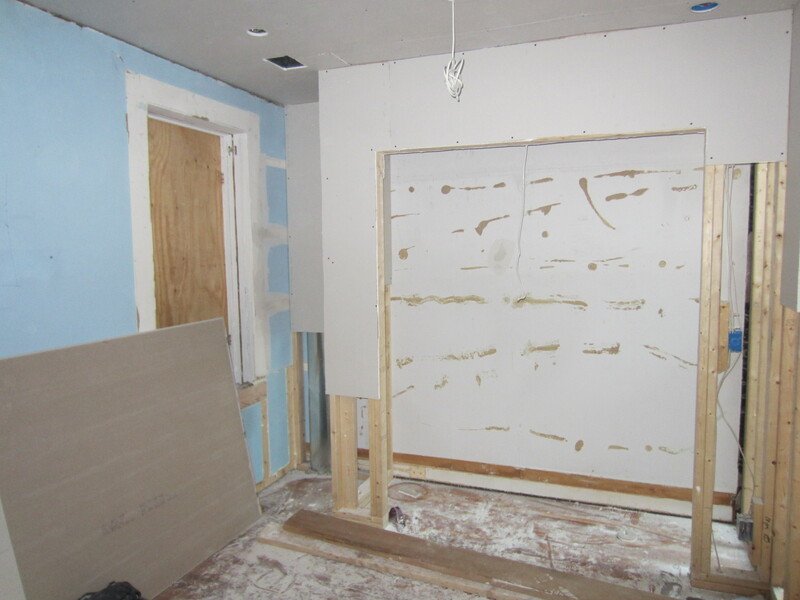 Here, the new closet is being drywalled, as well. 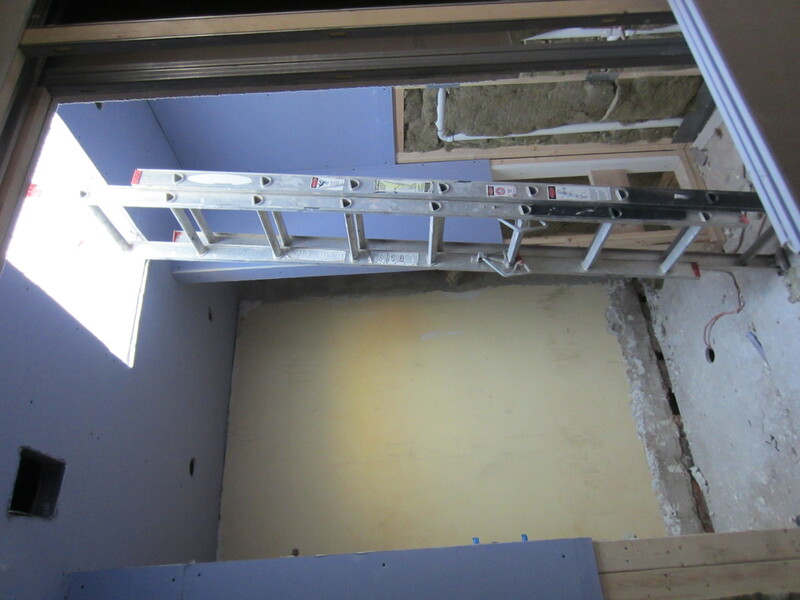 Drywall has begun around the skylight in the stairwell, below. 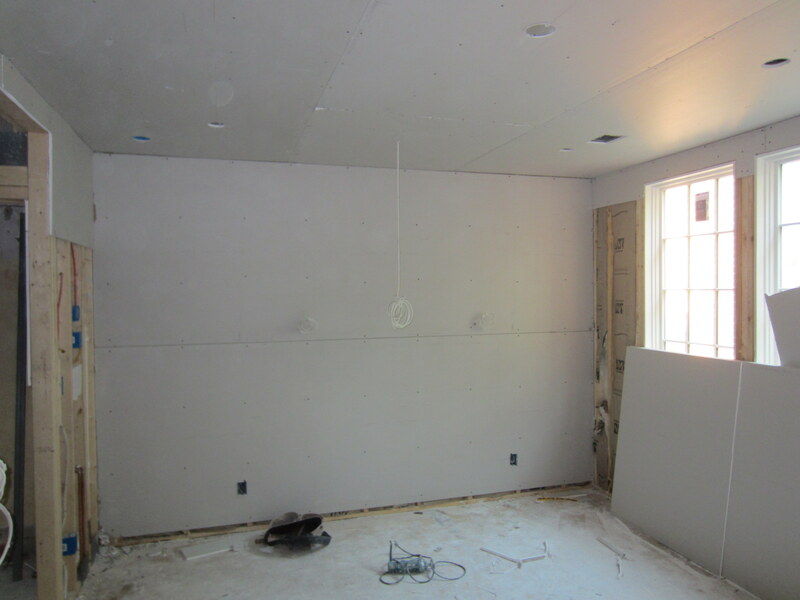 In addition to drywall installation, the crew also is addressing the plastering needs of the house on the exterior walls. 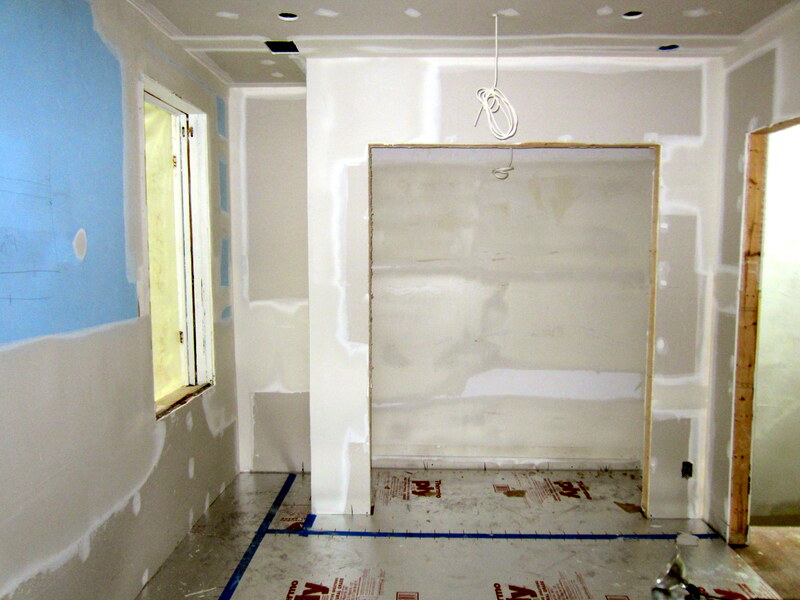 Here, an initial coat of plaster has been applied at the left of the photo, where the linen closet used to be. 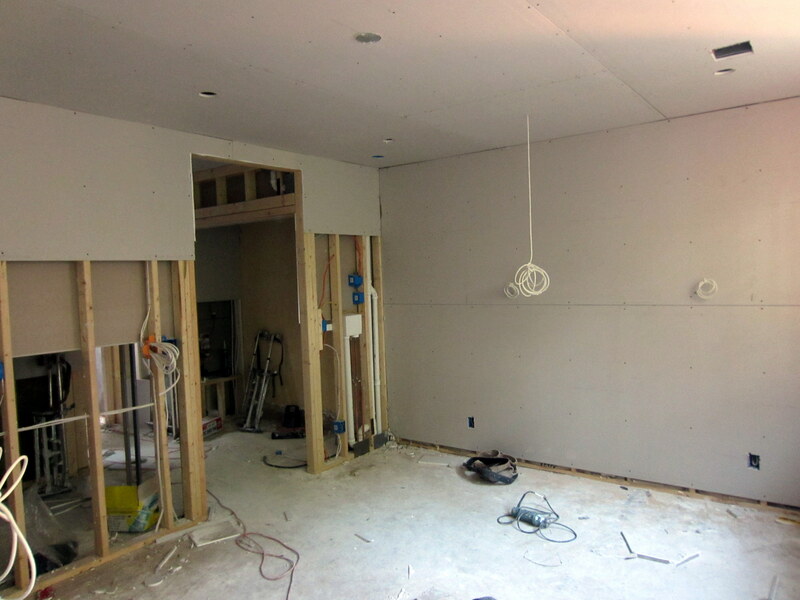 Drywall activities in the front part of the first floor focus on the east wall, including the TV niche, and the ceiling. 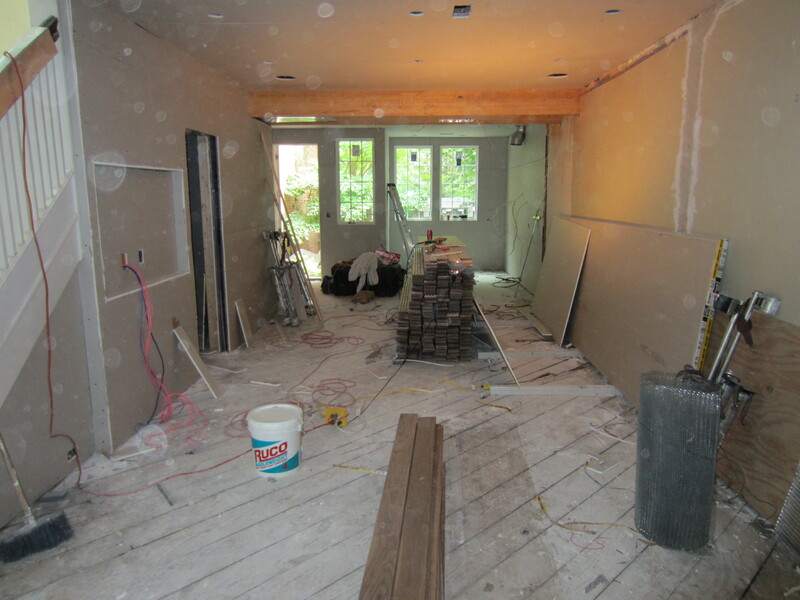 The strip of exposed brick on the west wall, which was where the old dining room wall ended, is being plastered, as well. 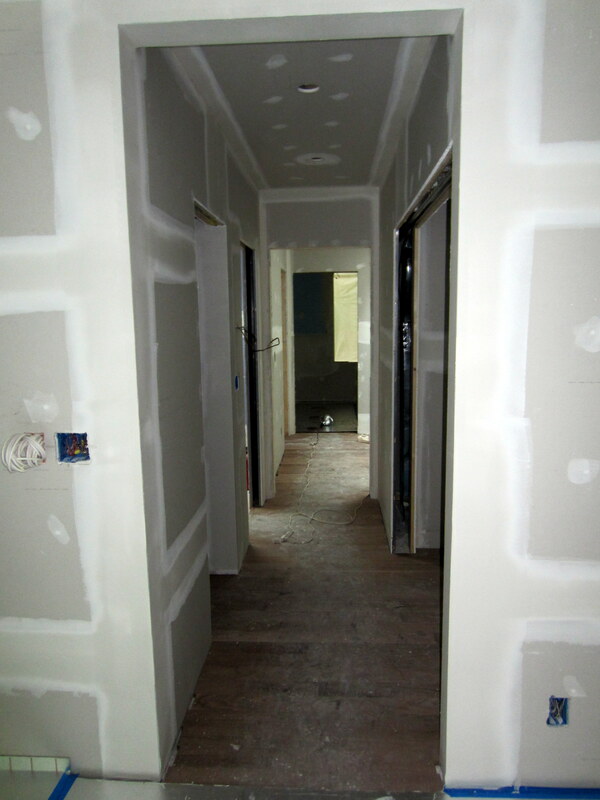 Since the rear of the first floor is all new framing, this all got drywalled. Here’s the main kitchen area. 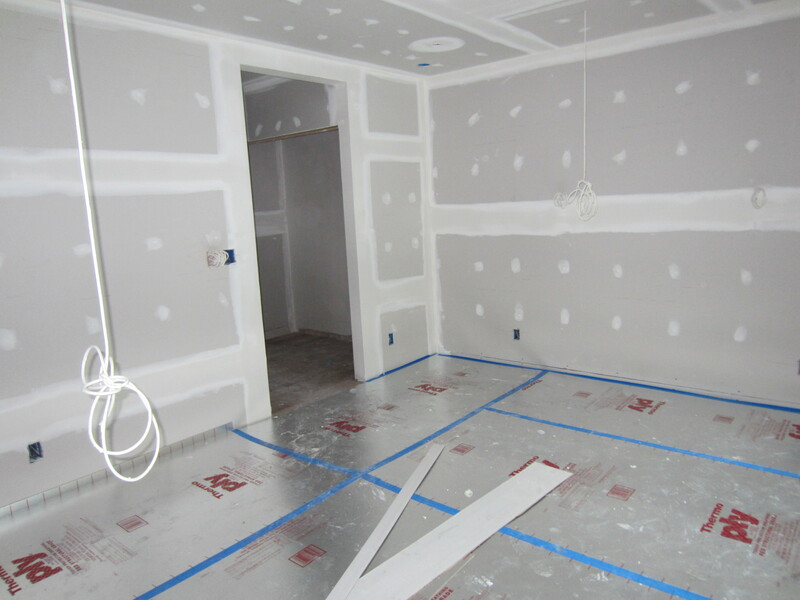 You can see where outlets and under-cabinet lighting will be located, as well as the vent for the hood over the range. 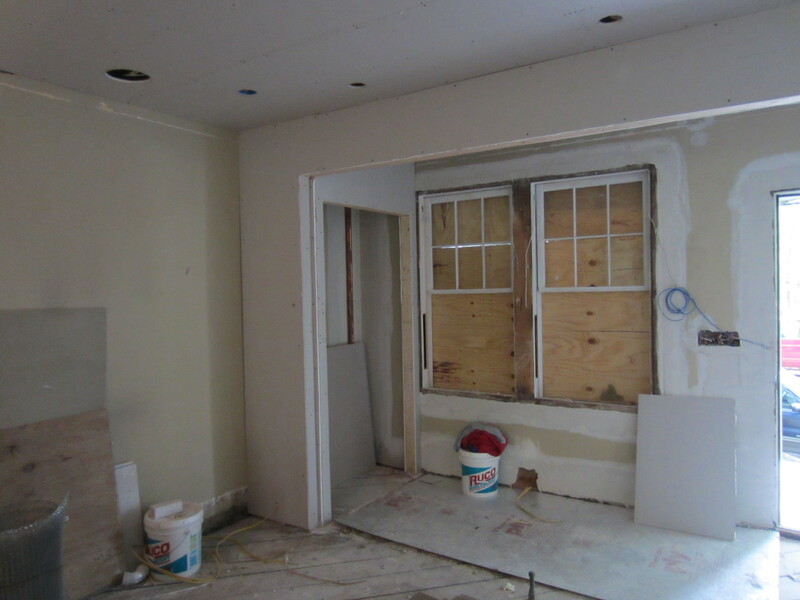 At the front of the house, the closet and vestibule area take shape with the installation of drywall. Plaster patching has been performed all around the door and windows, to address the refurbishing of these components. 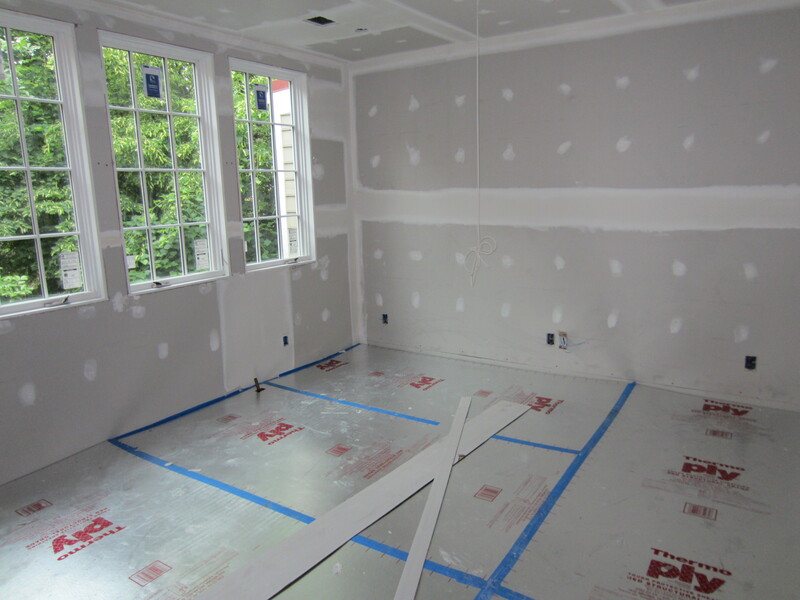 First floor drywall and plaster is complete at this point (check out the west wall – the guys did a great job blending in the new plaster with the old). 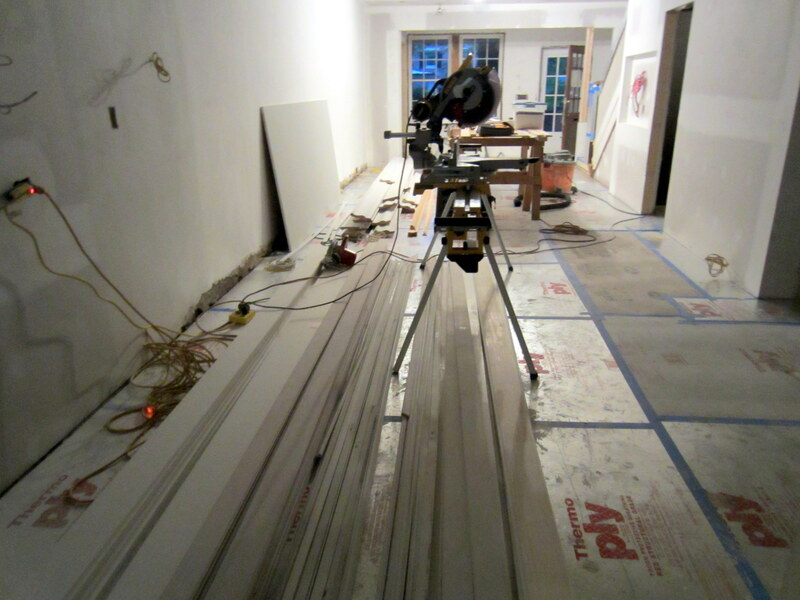 They guys are gearing up to install trim right after drywall, including crown molding, which you can see next to the table saw. This molding was the unlikely subject of intense debate (seriously) and second-guessing for about a week before final decisions were made. Completed kitchen area is below. The wall under the bulkhead was the exposed, demo’d brick wall from the back of the house. 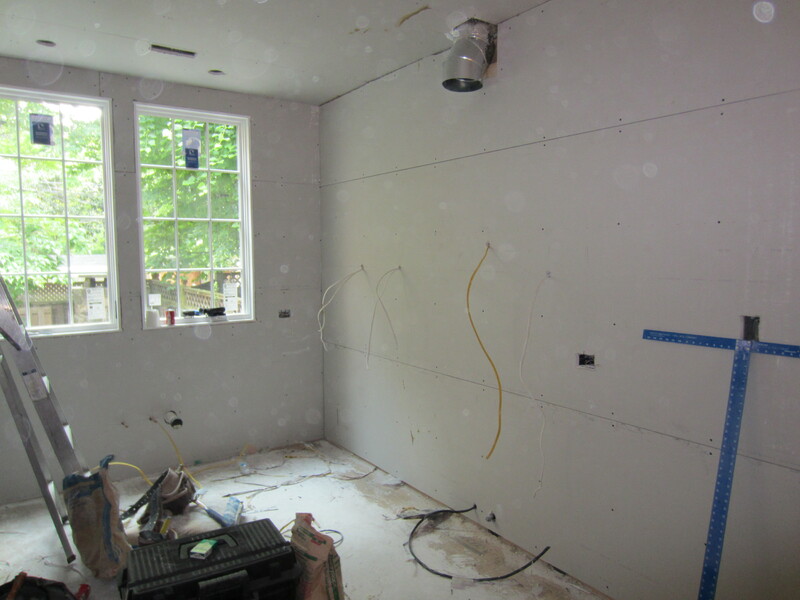 All of this will be covered soon by kitchen cabinets, so we’ll never see it again, but the plaster repairs look great, nonetheless. Glad to read that it was a horde and not a herd. Much better workers, I’m sure. Wo! 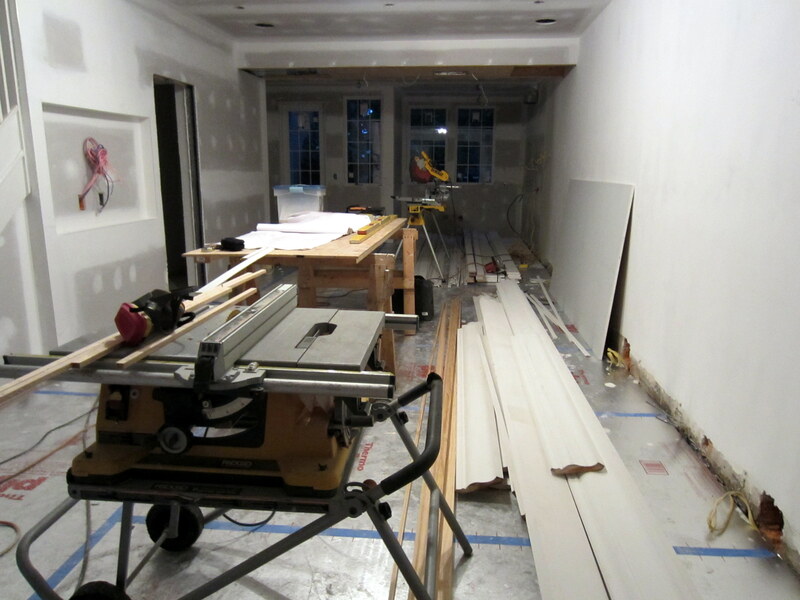 It’s almost move in ready:)… All kidding aside.. that is major progress! !